Rotational dynamics is the study of motion of a rotating body about its axis of rotation. All the particles of the body other than the particles along the axis of rotation will be having angular displacement. It is the angle turned by the body with respect to its initial position about its axis of rotation. It is same for all the particles of the body even though they are at different distance from the axis of rotation. 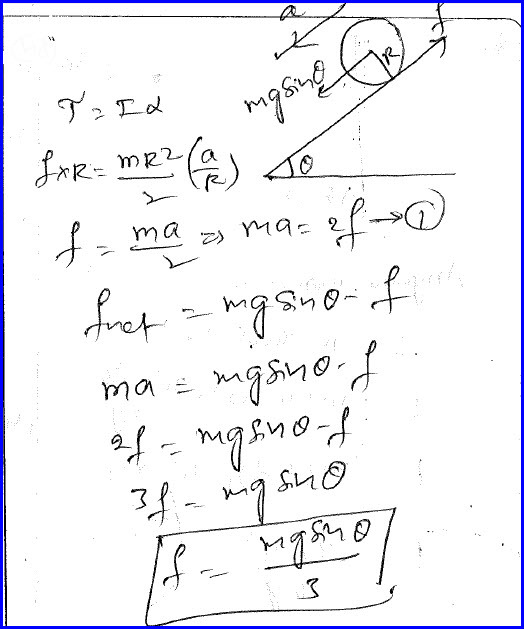 Thus we do study rotational motion in terms of different set of technical terms when compared with translatory motion. 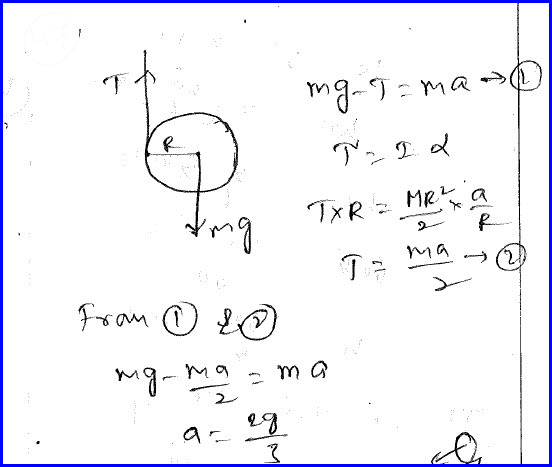 We have moment of inertia that plays the same role of mass in translatory motion and we use torque here that is similar to force while studying translatory motion. Similar to linear momentum of the body in translatory motion, we use angular momentum and its conservation in rotational dynamics. 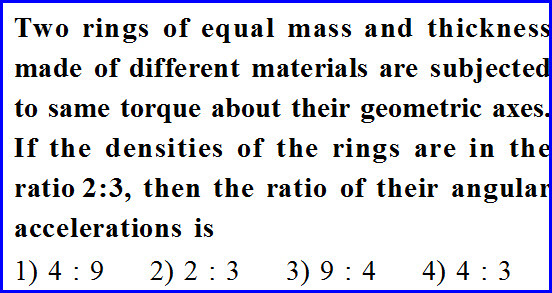 Two rings of equal mass and thickness made up of different materials are subjected to same torque about its geometric axis.As the materials are different, their densities are different and we need to find the angular accelerations ratio and the problem is as shown in the diagram below. We know that torque is the product of moment of inertia and angular momentum and when the torque is constant, angular acceleration is inversely proportional to the moment of inertia. 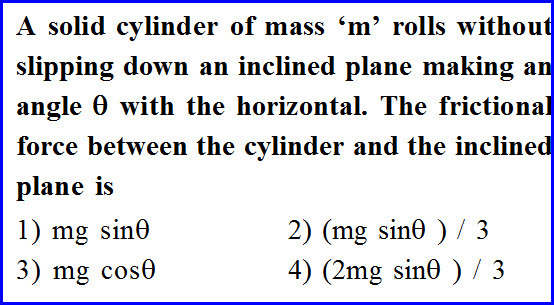 It is further given in the problem that the mass of the particles are same and the mass can be expressed as the product of volume and density of the body. Volume can be further expressed as the product of area of cross section and the thickness of the ring. Problem can be further solved and we can find the angular acceleration ratio as shown in the diagram below. 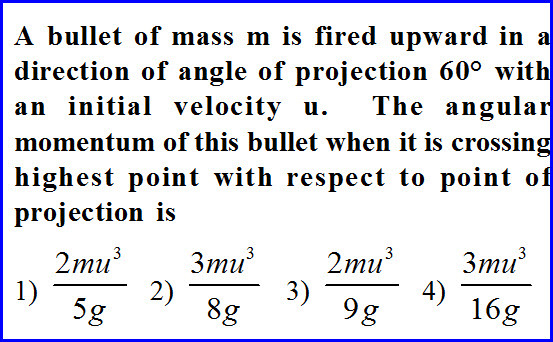 A bullet of known mass is fired upward in a direction with a known angle and known velocity. We need to measure the angular momentum of the body when it has reached its highest point and the problem is as shown in the diagram below. Angular momentum is defined as the moment of momentum. Its magnitude can be found as the product of mass of the particle, distance of the particle with axis of rotation and the velocity of the particle at that instant. Distance is nothing but the maximum height of the projectile and the problem can be solved as shown in the diagram below. We know the torque as the product of moment of inertia and the angular acceleration and we know the formula for the moment of inertia. 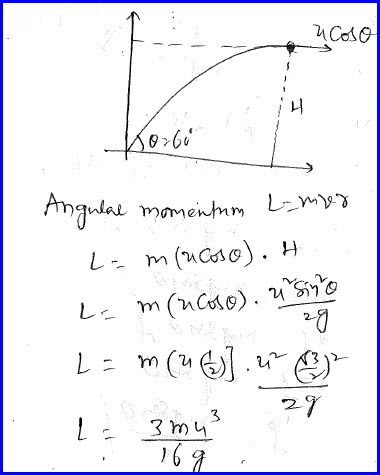 We can also apply the angular acceleration in terms of linear acceleration and and the radius of the motion. As the body is moving down, frictional force acts against the motion in the upward direction along the inclined plane. We can write the net force as the difference between component of weight and frictional force and it can be solved as shown in the diagram below. 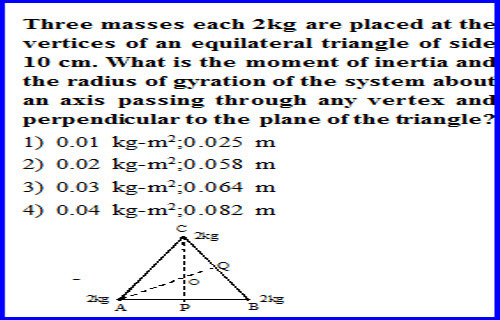 Three masses each of mass 2 kilogram are placed at the vertices of an equilateral triangle of side 10 centimeter. We need to find the moment of inertia about an axis passing through any vertex and perpendicular to the plane of the triangle. Problem is as shown in the diagram below. 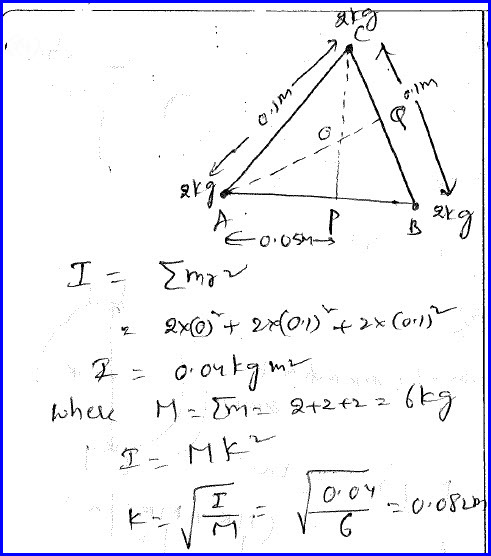 Moment of inertia of the system is the sum of moment of inertia of each particle of the system and it can be measured in terms of radius of gyration also. 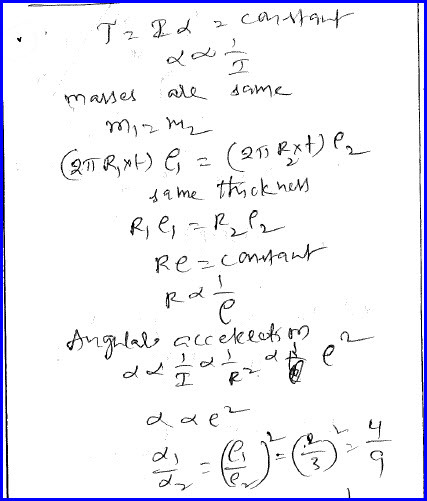 It is the effective distance of total mass of the particle concentrated at a point from the axis of rotation. Reel of thread in the form of a solid cylinder of mass M and radius r is allowed to unroll by holding the loose end of thread in hand. We need to find the acceleration with which the reel falls down and the problem is as shown in the diagram below. We can write equation of motion to a body in the terms of force as shown in the diagram below. By applying the definition of the torque also, we can solve the problem as shown in the diagram below.